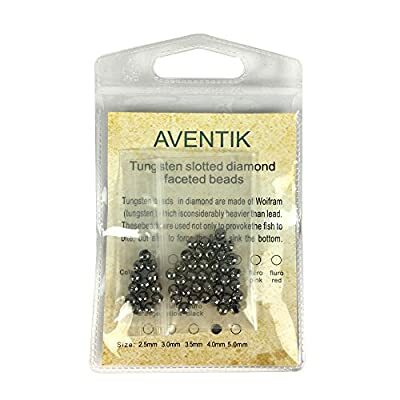 Think fast and Think deep, Aventik 50pc Tungsten Beads Diamond Faceted Slotted of highest industry standard and the best finish. These diamond faceted tungsten beads reflect sunlight like a disco ball. The reflection will draw the attention of fish and lure them to bite. Slotted opening excellent for a great variety of fly hooks including jig hooks. Tapered drilled hole in the beads allows the beads easily and smoothly to slide around the hook bend. 50pc pack a great value for fly tying. Top quality 100% satisfaction. colors :gold (24K real gold coating), nickle, black nickle, copper, silver, fluro pink, fluro red, fluro orange, fluro yellow, fluro black. Size info 3/32''(2.5mm) for hook size14#, 16#, 18#; 7/64''(3.0mm) for hook size12#, 14#, 16#; 1/ 8''(3.5mm) for hook size 10#, 12#, 14#; 5/32''(4.0mm) for hook size 8# ,10# ,12#; 7/32'' (5.00 mm) for hook size 4#, 6#,8# . Most fish feed on nymphs and aquatics in the water rather than on the surface. To angle effectively, we will need to get our flies down fast and deep. Aventik tungsten beads are the best solution. They are the highest industry standards, Tungsten is 70% heavy than lead and 100% more than brass. More important, it is environmental friendly. The more we fish with tungsten sinkers, the more peace in the nature and in our mind. Think fast and Think deep, Aventik 50pc Tungsten Beads Diamond Faceted Slotted of highest industry standard and the best finish. Tapered drilled hole in the beads allows the beads easily and smoothly to slide around the hook bend. 50pc pack a great value for fly tying. Top quality 100% satisfaction. colors :gold (24K real gold coating), nickle, black nickle, copper, silver, fluro pink, fluro red, fluro orange, fluro yellow, fluro black. Size info 3/32''(2.5mm) for hook size14#, 16#, 18# ; 7/64''(3.0mm) for hook size 12#, 14#, 16#; 1/ 8''(3.5mm) for hook size 10#, 12#, 14#; 5/32''(4.0mm) for hook size8# ,10# ,12#; 7/32'' (5.00 mm) for hook size 4#, 6#,8# .